Salesforce this week detailed progress on Einstein artificial intelligence. Less clear was how a new IBM partnership will change Salesforce AI plans. Here’s what’s behind the headlines. What’s the state of Salesforce Einstein, the portfolio of artificial intelligence (AI) capabilities announced last fall? Salesforce generated plenty of media coverage this week with two big announcements. Here’s my take on the realities of a partnership with IBM and what we have yet to understand about the packaging and pricing of Einstein. The first announcement from Salesforce this week was the unexpected bombshell on a new partnership with IBM that headlines simplified as “Watson meets Einstein.” As described by Salesforce CEO Marc Benioff in this CNBC appearance, one key benefit for Salesforce, and perhaps the first and easiest to implement, will be access to IBM cloud-accessible data from the Weather Company and other high-scale sources. Data is a key ingredient of accurate AI, and in the wake of Microsoft’s acquisition of LinkedIN last year – a real competitive threat — Salesforce can only benefit from significant data partnerships. Benioff cited a scenario in which weather data could be used by insurers to alert policy holders in the path of a predicted hail storm to park their cars indoors. Benioff also noted that IBM offers cloud compute capacity and systems integration muscle. Here’s where joint IBM-Salesforce customers are most likely to benefit. IBM amped up its focus on CRM generally and Salesforce specifically last year by acquiring long-time Salesforce partner and systems integrator Bluewolf. And in yet another benefit to Salesforce, IBM committed to using the Salesforce Service Cloud internally. Given the scale of IBM’s 380,000-plus-employee workforce, that’s a significant customer win. As for the potential combination of Watson and Einstein AI capabilities, we’ll have to wait and see what the deal brings. Aside from application-integration and API-level ties expected as soon as next month (and, I suspect, already underway through Bluewolf), both companies stated that we won’t see Watson-meets-Einstein synergies until the second half of this year – at the earliest. MyPOV on the IBM Partnership: Salesforce has no lack of data science talent and capabilities, so I see IBM’s data assets and systems-integration muscle as the lure of this deal from Salesforce’s perspective. As for IBM, it’s way to grow the systems integration business while bringing Watson into the conversation with joint customers. This week’s second announcement came in the form of a one-hour “Year of Einstein” videocast led by Salesforce execs including CEO Benioff and co-founder Parker Harris. Digging into the details, Chief Product Officer Alex Dayon talked about the 10 new Einstein AI features released in last month’s “Spring 2017” release. 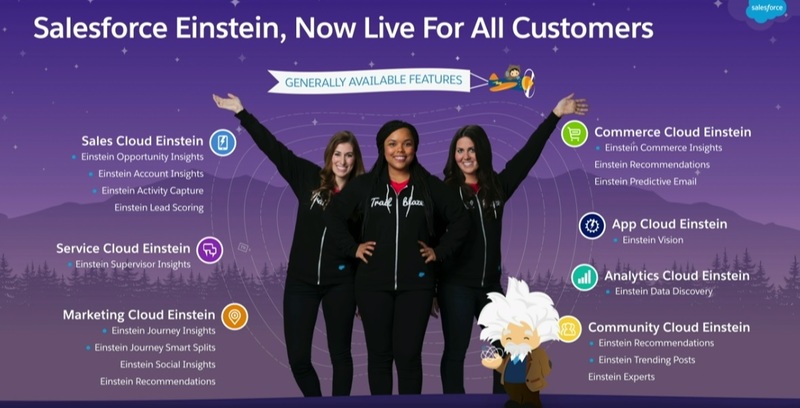 Salesforce now has more than 20 Einstein features generally available (including 16 listed in the slide below). This slide from the Salesforce “Year of Einstein” video streamed this week lists 17 of the 20 AI features now generally available from the CRM vendor. All 45 of the Einstein features planned for release in 2017 are detailed in my latest research, “Inside Salesforce Einstein Artificial Intelligence.” This 19-page report explores the foundational requirements of AI success, which include high-scale data, massive compute capacity, advanced data-science capabilities and plenty of time to work with all of the above. The report explores Salesforce capabilities on all these fronts, including the two years it spent developing the machine-learning-based predictive data pipeline that will power the vast majority of Einstein capabilities. Finally, it looks at Einstein compared to the cognitive and AI capabilities currently available or, in some cases, in development, within IBM, Microsoft, Oracle and various public cloud service providers. In Tuesday’s video, Salesforce execs stressed that Einstein is “built into the platform” and now “available to all Salesforce customers.” But packaging and pricing varies by feature and cloud. On the most popular clouds — Sales, Service and Marketing — Einstein entails extra cost, and in some cases it’s available only to certain license tiers. For example, on the Sales Cloud Einstein Opportunity Insights, Einstein Account Insights and Einstein Activity Capture are bundled together for $50 per user, per month, and they’re only available to those with Sales Cloud Enterprise or Unlimited licenses. On the Service Cloud, Einstein Supervisor is a bundle of the pre-existing Omni-channel Supervisor and Service Wave Analytics apps with the Analytics Cloud Einstein Smart Data Discovery feature. In this case, Einstein is reserved for customers using Enterprise and Unlimited licensing levels and optional apps. Omni-channel Supervisor, for example, is included as part of Service Cloud Enterprise edition and higher. The Service Wave Analytics app is optional and starts at $75 per user per month. Analytics Cloud Einstein Smart Data Discovery, which is optional, is priced based on data volume and user counts. So Einstein Supervisor is “included” with other offerings, but they all happen to be available only to those with Enterprise-grade-plus licenses and an optional add-on application. Marketing Cloud Einstein Journey Insights and Einstein Segmentation are available with the combination of any Marketing Cloud license and a Krux license. Pricing is based on Krux data collection volumes and storage and data processing use cases. On some of the newer clouds that Salesforce is hoping to grow, Einstein features are included. Commerce Cloud Einstein, for example, is built into the Commerce Cloud Digital service. And in the Community Cloud, Einstein Recommendations and Einstein Trending Posts are included at no cost with any license. Other Einstein pricing is detailed in this press release. MyPOV on the Einstein Rollout: It should be no surprise that Salesforce’s most sophisticated, in-demand and potentially labor-, time- and cost-saving capabilities are being tied to higher license levels or optional features. A key goal with Salesforce Einstein is to help people focus on what matters by getting redundant, time-consuming work out of the way or by presenting the lowest-hanging fruit, such as ripe sales leads, based on smart, predictive analysis. As I conclude in my report, the big challenge for Salesforce customers will be calculating the value of Einstein capabilities before turning those features on for lots of users.